This is the classic Pencil Pine, and Cupressus sempervirens ‘glauca’ can be used in a number of landscaping applications. Commonly called the Italian Pencil Pine, once established this low maintenance tree has a natural columnar habit. It requires little to no pruning to maintain it naturally tidy upright shape. Aromatic foliage with a good blue green colour, and this varietey and will produce fewer fruits to nuts than others. A very easy to grow tree, best grown in full sun in a humus rich fertile soil. It will grow in part shade, however deep shade is not suitable. The root system is generally regarded as non invasive and surface roots cause few problems. This is a tree that is suited to use to create focal points in the garden, a stand alone specimen can work well in larger gardens. Plant Cupressus sempervirens ‘glauca’ either side of a pathway or entrance to make a statement, or use it to line driveways. With its narrow growth habit it can also be used as an informal or formal screening plant along a boundary where its height can be an advantage in blocking out two story buildings..
Generally not required at all. Only removal of any dead wood, or errant sideways growth. Spread – Will spread to around 1 – 1.5 metres. 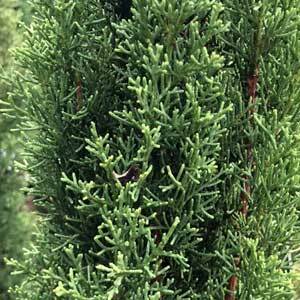 Cupressus sempervirens ‘glauca’ is available from the following participating nurseries.